November 6, 2013 November 17, 2013 Posted in Travel Posts. So I’ve been in this new country for about three days now (as of writing) I am going to say the obvious and state that it is so different from Japan. I instantly noticed the chaos coming back and this is not necessarily a bad thing. On the metro from the boat I felt the people crowding and pushing me out of the way, now this is far more like Asia. Japan has been a cultural experience but the one thing you notice more about it than anything is the organisation, this has now been removed. South Korea is a lot more chaotic, there is a lot more people selling things on the metro, more people selling food on the street, and a bit of traffic chaos to deal with too. I think I have been somewhat missing this chaos, the way that people push past you like you don’t exist without saying anything may feel like utter rudeness from a westerners perspective but this is perfectly normal, or at least that is how it feels, either join in or be pushed around. When I got off the tube I was approached by a random guy who spoke very good english who introduced himself as Mr Cho, he seemed like he really wanted to help me find places and get to know Busan a bit more but there was something a little shady about him. I my hardest not to judge people but sometimes you just have to go with your instinct, he told me he was the president of an import/export business and if I had time tomorrow I should call him so that he can show me Busan a bit. I don’t know why I took this as suspicious behaviour but I did, I took his mobile number just to get rid of him and told him if I have time I will call him with no intention of doing so. I spent the first day just getting my bearings in Busan, I had a massive amount of information to process after talking to the hostel owners about where to go, I only had one or two places in my head, the first being Jeju island and the second being Seoul but my theory was there must be lots more to see between these places and to use the hostel owners to put together a plan of sort. So now I have some sort of plan I spent the second day in Busan taking in some of the sites, the first being Beomeosa, yet another temple. Yeah remember when I said you might think I was all templed out but I can still go see them I just can’t go and see so many in a day/week anymore. I think it’s because I still find them very tranquil places to be and they really give me headspace something to keep in mind when I return to ‘normal’ life. Beomeosa Temple is up on a hill, you get to it via the metro then hike about four kilometers up the hill, there is a bus that goes up the gill but I always feel that if you take the bus to these places then you are sort of cheating. The hike for me is really part of the experience and if I can I always will walk up rather than get any form of transport. 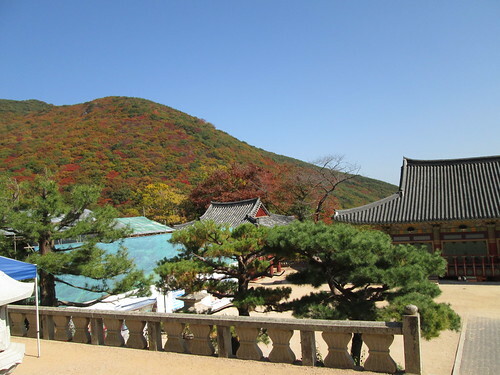 At the top of the hill you are greeted by a beautiful view of the temple and this time of year the whole place is surrounded by forests turning all sorts of autumn colours. Autumn is one of my favourite times of year, I think it’s the vast array of colour you get in the trees which the following photo should demonstrate. When you walk through the temple gates you are greeted and looked upon by four temple godlike statues, I don’t know anything about these gods but I did see that one of them was standing on one of his servants, or at least I think it’s his servant. From there you can optionally take a hike up to a peak at 801m high, the hike will take about an hour at an average pace), consists mostly of traversing large rocks as steps, is mostly covered by trees and attracts a large portion of Koreans, in fact in the two or so hours I spent on the mountain I was the only westerner. The view from the top is stunning and worth every ounce of sweat that it took me to get up there I put together a panorama and you really have to view this full resolution to get the full effect. I also put together a little video of it too, enjoy. With that walk done I took another metro journey over to see a bridge which is lit up at night, apparently a load of people come to see this and I’m sorry to say I was not that impressed, the Golden Gate is much more impressive in my views but that might be just because I know more about it and really wanted to see it because for me it was more iconic. On returning to the hostel after seeing the bridge who do I bump into? Mr Cho. 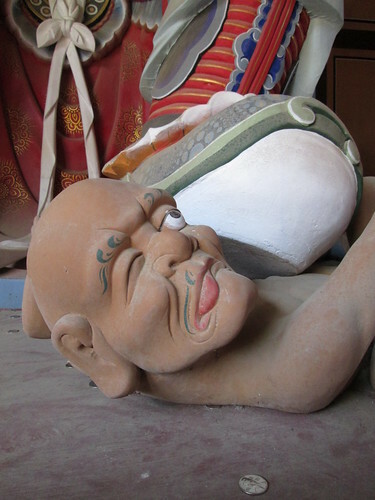 “Oh god” I think, he asks me why I didn’t call him and I told him I had been to the temple and bridge today with a long walk too so I had no time. He seemed very concerned that I did not know what to do in Korea and yes I do have a language issue here but the girls in the hostel have been so helpful that I don’t really need any more help right now. He asked me could he be my companion for tonight and I politely refused telling him that I had to get up early tomorrow for a flight which is only a small lie, yes I had a flight booked but that was not until 17:00 but I still felt very pressured and uncomfortable around this guy so I went with that feeling. So that was my introduction, an awesome view, great hostel, oh and I managed to fix a pair of trousers that broke on me while in Japan. This is ultra awesome because I have been trying to get them repaired in Japan and people quote me 3-4 days to do it, 1 day in South Korea for the measly sum of £3.